A product with a powdery texture that requires only the addition of egg, oil and water to produce a chocolate cake with American finess, to style and form with your signature! A complete mixture requiring only the addition of egg and water, so as to make a sponge cake or Swiss rolls that gives volume and a uniform distribution of the materials in the dough. Full flavoured flour, suitable for the manufacture of all kinds of home made recipes. Gluten-free flour for people who are allergic to gluten. 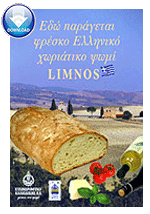 Special ready mix for Christmas sweet bread "Tsoureki"
Specialty rye flour mix, with traditional taste. Good news for bakers who can be sure that they have a product with high quality. A product that is easy to work with, that gives volume and a uniform distribution of the materials in the dough. For the production of delicius yellow bread with golden crust, tasteful, obtained from milling 100% first quality ingredients. Specialty sunflower bread mix, with traditional taste. Excellent mix. Six grain bread is very popular in Austria and found in almost every bakery.